Congratulations to Jarred Young, who has been awarded an Alfred P. Sloan Foundation Scholarship. The scholarship, which is managed by the National Action Council for Minority Engineers (NACME), offers scholarship support to underrepresented students who are early Ph.D. students in engineering, natural science, and mathematics. The Sloan Foundation Scholarship was established in 1995 and according to the Sloan Foundation website, has provided support to over 900 minority Ph.D. students in the aforementioned disciplines. U-Md. Is one of 36 institutions listed on the Sloan Foundation site that is currently offering Sloan-sponsered scholarships. Young completed his B.S. 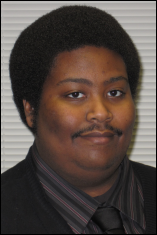 in Aerospace Engineering from the University of Maryland in 2009 and is currently working on both his Master’s and Ph.D. under Dr. Raymond Sedwick with the Space Power and Propulsion Lab. His research interests include space propulsion systems, electrostatic thruster technology, and plasma-material interactions. He was inspired to work with space technology by his family, especially his grand-father William, a former machinist for NASA Goddard Space Flight Center. While in graduate school, Jarred has also been the recipient of the Louis Stokes Alliance for Minority Participation Bridge to the Doctorate Fellowship (2009-2010), the National Minority STEM Fellowship (2010-2012), and the Alfred P. Sloan Scholarship (2012-present). Jarred is currently working on a research project in the area of plasma-material interactions. The project, currently titled “High Energy Plume Impingement on Spacecraft Systems,” involves using a specially-designed miniature ion engine that will create an ion plume that could be typically found in a formation flight environment. A variety of specimens will be immersed in this plume in order to study the possible damage effects on typical spacecraft material and components, such as kapton or solar cell cover glass. Jarred has also worked on the Lunar Reconnaissance Orbiter (LRO) and Soil Moisture Active Passive (SMAP) projects as part of an internship with NASA Goddard. As a NASA MSIEP intern, he also worked on a research project looking at pilot’s reactions to differing weather conditions using a low-fidelity flight simulator and eye-tracking system. In his free time, Jarred plays his trumpet with the University Jazz Band and enjoys watching science-fiction (especially Star Trek).